It’s difficult to say how the conversation between Angela Merkel and François Hollande actually unfolded. Perhaps the German chancellor put him off with an evasive answer, claiming that no information had been reported about Fabius’s negotiations. Although in that case why did the BND spies need all those tape recordings? Or maybe she said that she learned to spy from American President Barack Obama, who is spying on her. The victim, Laurent Fabius, made a rather strange comment, saying that Merkel had explained that it had been a case of «incidental eavesdropping». This means that the BND was only eavesdropping on the people who were speaking with the French minister, but absolutely not listening to him at all. So one must assume that Fabius’s words were redacted from the conversations that were taped, but the words of his companions were recorded and reported to Madam Chancellor. Actually, that was precisely the whole reason the scandal erupted. The German radio station RBB reported that in addition to foreigners, the BND also spied on its own citizens, which is something that agency is expressly forbidden to do (that’s the job of the BfV counterintelligence service), but such news would hardly have prompted a big outcry. Except that these weren’t your average German citizens. For example, the BND was snooping on a senior diplomat, Hansjörg Haber, who from 2008 to 2011 headed the EU mission in Georgia, and afterwards directed the EU Civilian Planning and Conduct Capability of the European External Action Service in Brussels. Currently Haber is the head of the Delegation of the European Union in Turkey. Martin Schaefer, a spokesman for the German Foreign Ministry, commented, «German diplomats know that their activities might be watched by foreign intelligence services, and so they take appropriate precautions, but no one in the Ministry of Foreign Affairs could have expected spying by the BND». So he commented… But what’s next? A picture of unremitting lawlessness of this very law-abiding European country can appear, if the entire mosaic is pieced together of the many scandals involving Germany’s intelligence services, starting with the American wiretapping of Angela Merkel herself back in 2013. That was a huge scandal, but instead of lodging a formal protest, the federal chancellor announced that «our partnership with America takes precedence, and this is how it should be for other European countries as well». In fact, that was also the position of Germany’s intelligence services, which have long worked with the CIA, violating Germany’s constitution and laws. So while the press was making such a fuss about the surveillance of the chancellor, the Germans were busy successfully staking out their European partners. 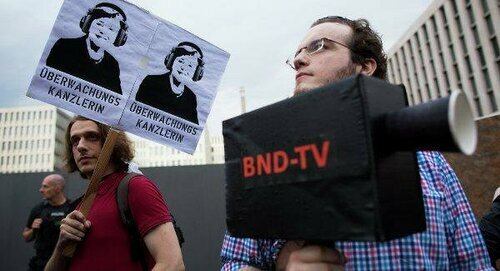 As a result, a scandal erupted last spring over the BND’s role in spying on Germany’s allies. 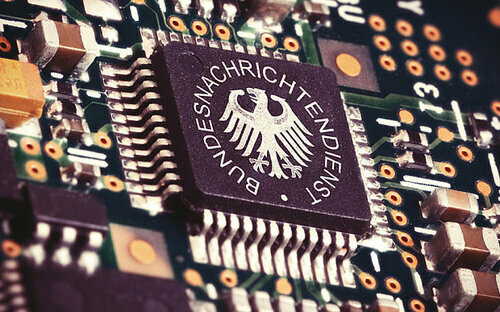 According to the magazine Der Spiegel, the BND intelligence service spied both at home and in Europe, at the order of the CIA, which is in violation of the rules established in the BND’s own charter. Among the BND’s espionage targets were major corporations such as the EADS Group and Eurocopter, EU functionaries with access to classified information, and prominent politicians. The BND was responsible for illegal activity, carried out at the order of the CIA, in a total of approximately 40,000 cases. And there was no proper oversight of these actions. Even from the federal chancellor’s office. It would seem high time to look into what was going on, but Berlin had no reaction. The German government has begun to soft-pedal the matter, ignoring the opposition protests and apparently satisfied with the explanation offered by the head of the BND, Gerhard Schindler, who «didn’t know anything about it». Opposition politicians have some strong opinions about this. They have called the BND a «criminal organization» that should be shut down ASAP and have labeled its actions treasonous. Bundestag deputy Ulla Jelpke declared that «if private hackers had been caught doing what the BND has now been caught doing, they would have been put behind bars long ago. This proves that Germany is not a victim of CIA spying, but is a partner in this spying, violating both the law as well as human rights». Gregor Gysi, the leader of an influential faction within the Die Linke party in the Bundestag, demanded an immediate investigation, based on suspicions that high treason might have been committed in the form of intelligence work conducted against the interests of Germany, or against German companies or companies with German stake, or against friendly politicians. The government could not ignore this demand. An official commission has been set up to study the BND documents. However, the string of scandals continued. The next scandal was dubbed «Murder in Ramstein». Glenn Greenwald of the Guardian has published materials revealing that US military operations are being conducted from within Germany. Drones are flown remotely from America’s Ramstein Air Base to attack so-called terrorists in the other countries. US drone attacks «against terrorists» have previously drawn the ire of the German public, due to the fact that they cause large numbers of casualties and violate the sovereignty of other countries (such as Pakistan and Yemen). Now it turns out that such operations are being directed from inside Germany. The German public demanded a new investigation, but authorities managed to hush up the matter. They were apparently satisfied by the statement from a Pentagon spokesman, claiming that Ramstein Air Base «does not directly fly or control any manned or remotely piloted aircraft». And now the wiretapping of Laurent Fabius… Poor German democracy that was so proud of itself proud of its democracy! What’s next? Three Bundestag deputies from the CDU, the SPD, and the Green Party were supposed to present a report about the BND’s activities in Europe before a Parliamentary Control Panel (PKGr) on Nov. 11. Earlier, the deputies had been given 900 pages of evidence, detailing which of their allies, in addition to French Foreign Minister Laurent Fabius, the German intelligence service had under surveillance. Only it’s hardly likely that a parliamentary hearing will produce anything. Germany’s intelligence services are like a camel train led by an American camel-puller. The Bundestag deputies have a job to do – they provide a clamorous accompaniment along the caravan’s journey. This is a democracy, ladies and gentlemen.